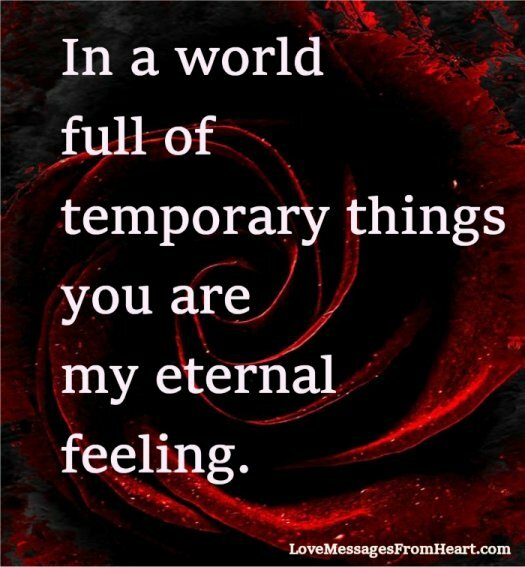 you are my eternal feeling. My feelings for you come deep from my heart … my feelings for you are like the rays of sun at noon. I love you. My feelings for you started the day we met, I just didn’t know at that time that it was love. Now my heart never lets me forget it. Put your head on my chest so you can hear the whispers of my heart, so you can sense my feelings for you. My feelings are deep as the ocean, as enduring as the stars, as pure as the freshly falling snow. All because of you. I love you. Some feelings come and go, but my love for you will never waver, never run dry. I want to shower you with kisses, I want to wrap my arms around you and hold you so close that my feelings for you will vibrate from me to you in the unspoken language of my soul.